So, at my recent judging in Concourse at the Muscle Car and Corvette Nationals I lost a couple points for the attachment finishes for these hood items. The judge indicated that the Acorn Nuts on the underside of the hood for the front trim piece should be body color as that part was installed before the hood was painted. Secondly, the studs that attach the NACA ducts to the hood should also be body color as those also were attached prior to paint. I have a concern that attaching these prior to paint would cause a cracking issue for the paint at the seam between these two parts. I have seen several cars with cracks in the paint along the front hood trim from these being painted in place. I would suspect the same issue and possibly even more for the NACA ducts as they are made out of different materials and would expand and contract differently in the sun and cold heating cycles. I posted this response in a Concourse forum and obtained this response from MCA National Head Judge Bob Perkins. Quote: If you have some time for a long video, but a good over view of the show take a look at this one. If you can make it to the end I get my 5 seconds of fame with the 72 Mach 1. Ended up taking silver in Concourse judging. I do have some questions with some points brought forward by the judges. 1 - It was pointed out that the acorn nuts on the front hood trim piece should be body color. Stated hood was painted with this part on. I am of the opinion this part was not painted already installed on the hood as it would lead to cracking in the seam between the hood and the trim panel. 2 - Pointed out that studs for hood scoops should be body color as well as they were also installed on the hood before painting. I again have a hard time believing this is the case as it would lead to more cracking issues around the scoop. 3 - All branded Autolite or Motorcraft components under the hood should be the same. It is my understanding the conversion to Motorcraft was not finalized until March/April 1972. My build date of early January 1972 Dearborn would proceed that date and allow for some variance in branded components vs all being the same. I would appreciate others views on these points. I do not have my judging sheet to reflect back on some of the other comments as I left the award and paperwork at my folks house in WI when we headed back home. I will have it back around Christmas. You have asked great questions that have been a bit controversial regarding 71-73 Mustangs. 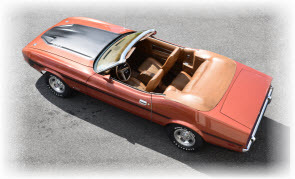 Typically 1973 Mustangs had the hood molding nuts and hood scoop hardware painted body color as the judges noted.Typically 1971 were not painted. The painted hardware practice stated in the 1972 model year. My opinion for 1972 is early no paint later painted. I have no dates on this change. I personally accept either for 1972. Motorcraft VS Autolite parts was another change over during the 1972 model year. If you are using genuine Ford parts most would be date coded. It's my experience a January 1972 Mustang would typically have Motorcraft parts. If not, I would look for date code to verify. I am thinking about trying to push this issue a little farther with MCA for a definitive ruling, but not to take up all of my time. Do others have original cars to reference across the 71-73 timeline? Other fact based experience or understandings to share. Just restored my 71 hood. It has been painted black over the original silver grey/green paint and the scoops hardware is as we speak in an acid bath. They were black. Meaning there was no original green or grey on them just the black over sprayed (even on the ram air plenum). The front molding had been removed and painted but the nuts were not painted. I can't say for sure about the front molding, but for the scoops, i'm pretty sure these had never been removed before. On my 73, back in late 80's, there was a flat hood (damaged just like the rest of the car but original), I've replaced it and I'm pretty sure the molding (painted) nuts were not body color. I had very hard time find 2 missing nuts back then. I've removed all the car moldings to clean underneath and had lost two somehow weeks later when I tried put all back. (that's when the young me realized that bagging stuff might be a good idea) Found replacements on a blue 72 coupe in a junkyard, also plated but not painted. If this piggy practice would be true you'd also have bare metal or just primer under the nuts and on top of the hood, there would be not paint under scoops either. Congratulations on the sliver, but it sounds like your judge was a bit too hard on his scoring of your car and you should have been awarded a gold. Wish I could help but maybe David's car would be a good example of a 73. +1. I checked last night on my 73 coupe as the underside of my hood is still the original medium metallic brown paint and the acorn nuts are painted body color on mine as well. Very interesting...was not aware of this. I would be really curious to see now if anyone has an original paint 71 and 72 and what the answer is on those. Thanks for sharing everyone. What's under the scoops then ? Under the front molding ? What was the painting order they've used? Prime, assemble and paint or even worse, assemble prime and paint? Very good feed back and examples to back it up. Thank you everyone and if some known original 71 & 72's can be identified it would be great to get some validation. Thank you, keep it going. Being the original owner of my '71 Mach, I can verify that my car came from the factory with unpainted acorn nuts across the front hood trim. (12-04-2018, 04:43 PM)Mac Wrote: Being the original owner of my '71 Mach, I can verify that my car came from the factory with unpainted acorn nuts across the front hood trim. Could you provide any pictures and your build date?